Okay, folks, it’s time to talk about a hot topic that’s surrounding us all, and there’s literally no escaping from (pardon the pun); immigration. With all the incredibly frustrating updates surrounding immigration these days and news of our current president’s impractical border wall plan filling up our Facebook feeds, there is one story that will warm your icy heart; and that’s the story of Vilma Carrillo. However, her story is not one that starts off well. Carillo is an indigenous Guatemalan woman who lived in the U.S. for a year with her husband. They were both undocumented farm workers in onion fields and warehouses, and while they were there, Carillo gave birth to their daughter, Yeisvi. Then, back in 2007 the family returned to Guatemala in order to look after Carillo’s dying mother. This, is where their horrific story truly began. Sadly, as the years went on, Carillo’s husband grew violent and abusive, so Carillo was often subjected to frequent physical abuse. She had 4 of her teeth punched out and she was dragged around naked by her hair (truly, truly awful). This horrific violence made her young daughter fear for both of their lives. 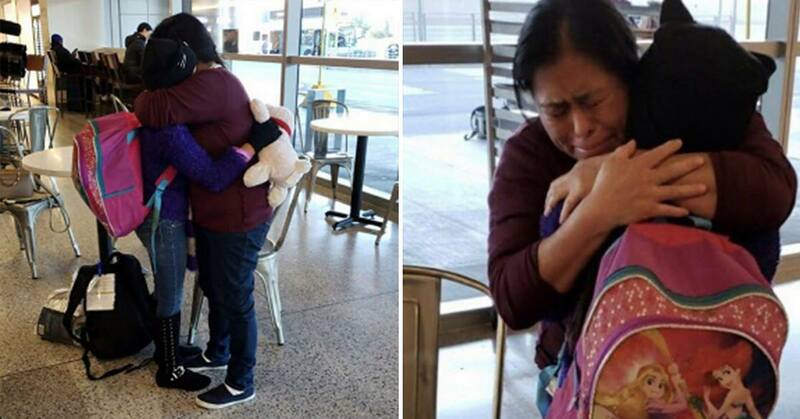 Seeing as she was a victim of extreme domestic abuse, and considering the fact that in her home country, there are no legal protections for domestic abuse victims, Carriol decided she wanted to return to the U.S. with her daughter Yeisvi in order to seek asylum at the Mexican and U.S. border on May 10th, 2018. 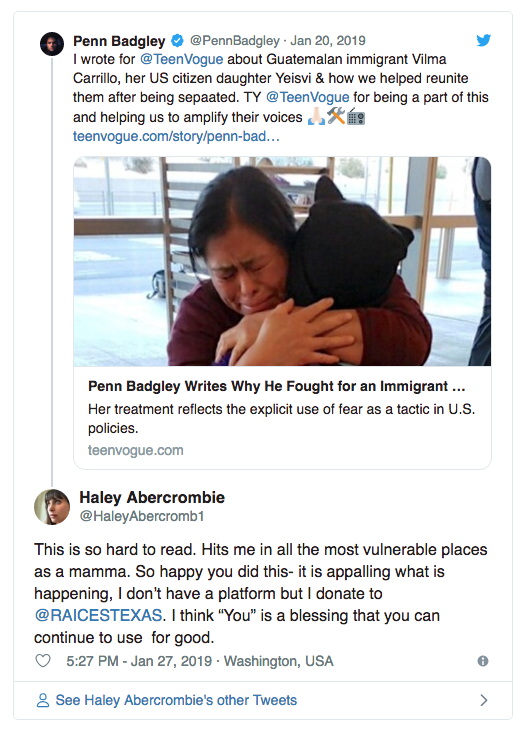 Unfortunately, they both arrived at the border around the time that Trump’s zero-tolerance immigration policy kicked in… so they were forced to separate. Carillo was detained by ICE agents, and once they discovered that her now 12-year-old-daughter was a U.S. citizen, Yeisvi was taken to live under the care of a foster family all the way in Georgia. Because Yeisvi was an American citizen, the matter became complicated. The U.S. District Judge Dana Sabraw ordered all U.S. immigration officials to reunite every separated family within 30 days. However, seeing as Yeisvi could not be detained with her mother, as she was not an immigrant, she was not subject to the federal ruling. Because of this, their reunion was delayed for 8 months. 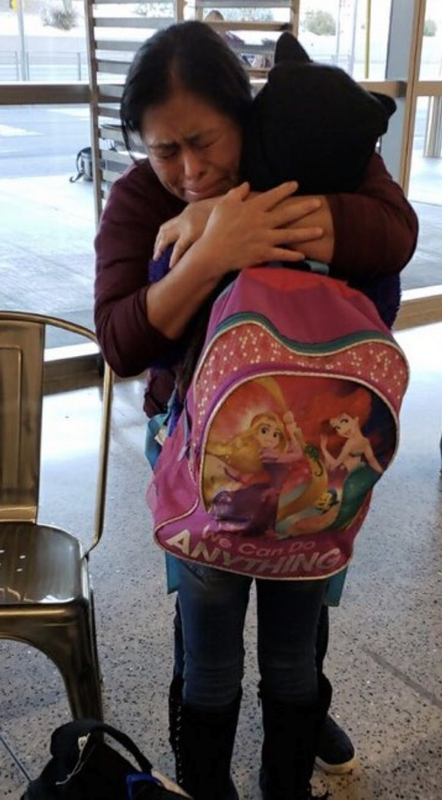 And then, finally, after 246 days, Carrillo was at last reunited with her little girl. 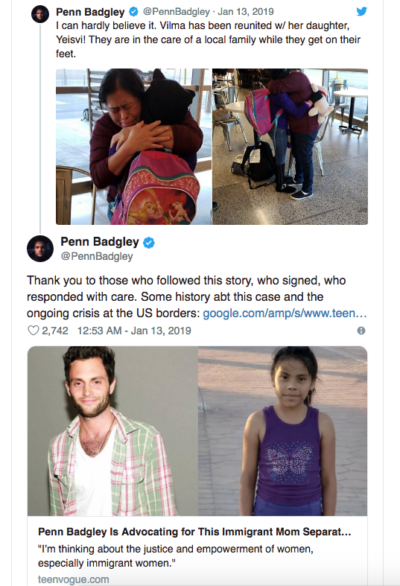 During the time she was separated from her daughter, Carillo’s heart-wrenching story caught the eye of the media.. along with a particular Hollywood personality. Actor Penn Badgley (You may know him from Gossip Girl and Netflix’s latest thriller series, You) teamed up with Atlanta’s Tahirih Justice Center and even visited Carillo while she was in the detention facility with her immigration court lawyer, Shana Tabak. Carillo will also be applying for a work permit, which asylum seekers are allowed to do after 150 days after applying for asylum. Tabak also told Upworthy that Carillo’s faith is keeping her hopeful. “I’m praying for the best. Everything is in God’s hands,” she said. So as you can see, a happy ending was had here. Now, let’s hope that in the near future measures will be put into place to stop something as awful as this happening again.